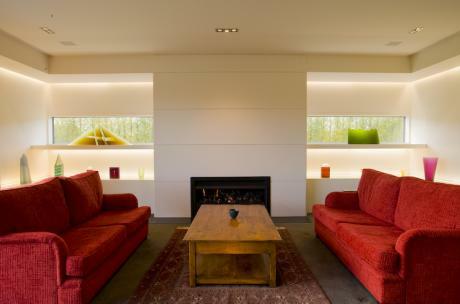 The clients sought a house to sit calmly and formally in the open rural environment. Working in central Christchurch, they both sought a retreat, traditional in form but modern in function and aesthetic. The formal areas are a quiet back ground to display a collection of cast glass sculptures. After visiting the site with its quadrants of poplars, a response of a 'Gothic Barn' was proposed. 'Barn' with its simple gable roof forms, screens and dovecotes and 'gothic' in its formal planning and austere black cedar cladding. The glass art works are housed in scooped out/sculptured forms in the formal living area, highlighted by recessed lighting. A large open site lent itself easily to maximising the passive solar gain to the house in the winter, with extensive screening and areas of eaves providing shading from the scorching summer sun. Laminated glass window treatment also provides subtle but effective protection to the interior. The spacious house opens simply out to the extensive grounds.